Running a Blog Do You Really Make Money While You Sleep? This question sounds so appealing to new or aspiring bloggers, doesn’t it? The idea of making cash while you dream is, well, a dream come true. But it definitely sounds too good to be true! That’s why I wanted to break down the rumors, set the record strait and give everyone the answer they have been wanting to hear. 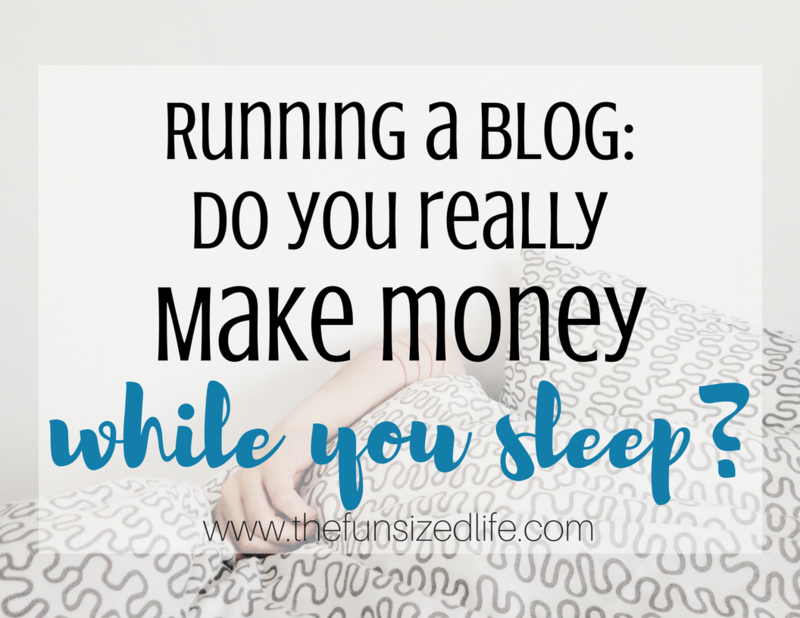 When you’re running a blog, do you actually make money while you sleep? The answer: YES. The rumors are true, but don’t think making money in your sleep doesn’t require work during your waking hours! Let’s talk about how to create a profitable blog, how to get paid in your sleep and how to actually enjoy your life while you do it! *This post contains affiliate links. I may make a commission on anything I recommend, but all opinions are my own. There are multiple different ways that bloggers actually make money. But, the passive income streams are going to be the ones that actually make you money while you sleep. Passive income is where you do the work first and then get paid for it over and over again. Affiliate marketing: I feel like I hear angels sing whenever I talk about affiliate marketing. It is my personal favorite way to make money blogging. What affiliate marketing is basically recommending things to your readers that you yourself already use and/or support. Companies then pay you a commission when your readers purchase or sign up for their product. So if you write a blog post with a few affiliate links, you can easily wake up in the morning having made some sales while you slept! Advertisements: We all know (and probably hate) advertisements right? Well, there are definitely ways to get paid for advertising without being sleazy or annoying. Most bloggers started with Google Adsense and then work their way up to bigger companies like Mediavine (my personal company.) I definitely encourage bloggers to avoid over-advertising as this is actually a huge turn off to most readers and will more than likely lose your traffic and therefore you lose money. Most advertising companies will show you your overnight profits so you can see just how much money you made while you were sleeping! Digital Products: Here’s another favorite of mine! If you are a blogger, chances are you are a creative type as well. This means you can take full advantage of creating and selling your own digital products! Promote them on your blog, social media or email and wake up to more money when someone purchases! To get more in-depth information on how to fully take advantage of these passive income options, check out my blogging course for all the best ways to start making money while you sleep. Now, don’t think getting paid in your sleep isn’t going to require some serious effort on your part! It most definitely will! Starting a blog is no easy task. Sure, it’s fast and easy to set up a blog, but building a following, promoting yourself and learning all the ins and outs takes a lot of effort. In order to start to make money in your sleep, you’ll want to work at creating quality content and building your page views. Page views are so important in fact, that I have an entire FREE section in my course all about it. Get FREE training on how to increase page views! Just like it takes work to build a following and page views for your blog, naturally, it will also take time. I didn’t start earning passive income (above a few dollars) until about 8 months into my blogging journey. But, I made a lot of mistakes along the way! One misconception a lot of people have is that once you start a blog, the world wide web will take care of the rest for you! In my Fun Sized Blogging Basics course, I have done my best to be totally honest about the serious commitment (both time and money) that blogging takes. It takes time and effort for sure, but when you find yourself doing something you love and getting paid for it over and over again, it is totally worth it! No, I am not just trying to get you to purchase my course! I would not have seen the success that I have with blogging if it weren’t for the bloggers who came before me! I am so thankful that I invested in their knowledge and expertise. If you want, take full advantage of the FREE lectures in my course and then check out some of the courses that helped me get where I am. 10 Day Blogging Quick Start – A 10-day course that teaches you step by step how to start a blog. Created by successful full-time blogger Abby Lawson. Brand Pitch Cheat Sheet – A helpful cheat sheet to get you started working on pitching to brands. Choosing Your Perfect Niche – Choosing your niche can be tough as a blogger, here is a great way to get some serious guidance. Food Blogger Pro – Food Blogger Pro is a terrific online course you can take that was created by the creators of Pinch of Yum. They have seen tremendous growth from their food blog and share all their knowledge with you to help you succeed as well. Fun Size Blogging Basics – Get all the information you need for getting a blog started with straight forward information and detailed step by step guides. Making Sense of Affiliate Marketing – Affiliate marketing is a great way to create an income from your blog. So much so that one blogger shares her secrets to making over $50,000 a month from it! Pinteresting Strategies – Learn the best methods for growing your Pinterest that no other blogger has talked to you about before! This helped grow my traffic huge AND it’s super affordable! Pitch Perfect – Pitch Perfect is a course I took hosted by successful blogger, Jenny Melrose. She will walk you step by step through how to pitch to brands and what to do once you’ve got them. One of the biggest lessons I learned blogging, that I don’t talk about enough is making sure to enjoy the work you do! I find the more I feel motivated, pumped up and inspired, the better my blog does, the better my posts do and the more times I make money in my sleep!